Ireland is situated between 51 and 55 degrees 30 minutes north latitude, and between 5 and 10 degrees west longitude. It is bounded on the north by the Ducalodonian sea on the west by the Atlantic and on the east and south by St Geroge's Channel. 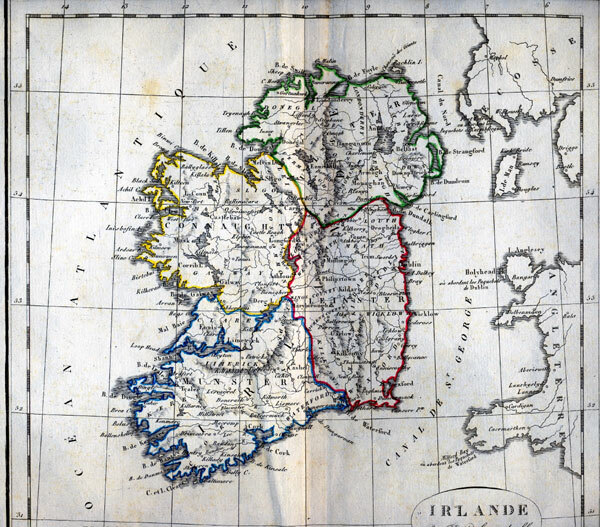 The extent or superficial content of this island is from the nearest computation and survey, found to be in length 285 miles from Fairhead north to Missenhead south; and from the east part of Down to the west of Mayo, its greatest breadth 160 miles; and to contain eleven millions sixty-seven thousand, seven hundred and twelve Irish plantation acres, which make seventeen million, nine hundred and twenty seven thousand, eight hundred and sixty-four acres of English measure, and is held to bear proportion to England and Wales as eighteen to thirty. From the east part of Wexford to St David's in Wales it is reckoned forty five miles but the passage between Domaghadee and Portpatrick in Scotland is a little more than twenty miles and the passage from Dublin to Holyhead in North Wales, about 52 miles.